Every cook has been there. You've followed the recipe perfectly, only to end up with a pot of soup that's as thin as water. Half-and-half can thicken your soup while also adding luscious texture but fewer calories than cream, but it's not right for all recipes. Once you've successfully used half-and-half to thicken your favorite soup, you might find you can't cook without it. 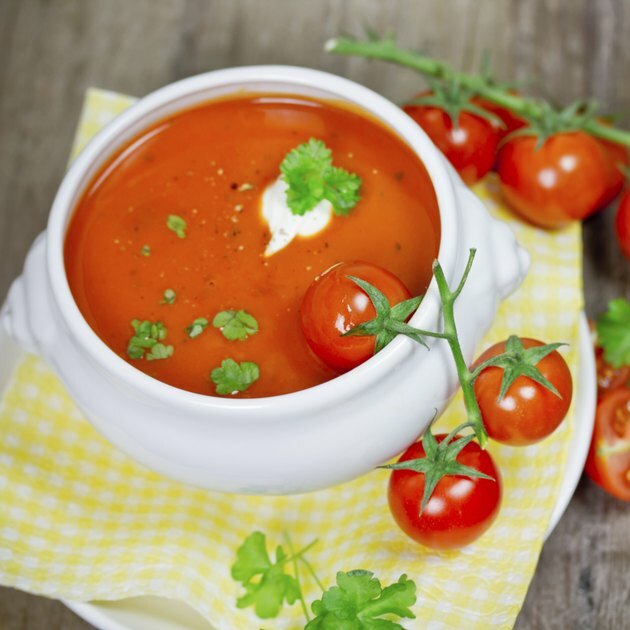 Half-and-half is the ideal thickener for smooth soups such as tomato soup or cream of broccoli. You also can add it to a pot of hearty vegetable or even a chilled summer soup such as cold beet or strawberry soup. Half-and-half isn't the ideal thickener for very delicate soups, however. Don't add it to a dish with a very light broth or one starring ingredients with mild flavors, such as mushrooms, as the half-and-half will overpower the dish. It's also not the best thickener for dense soups such as chili. The exact amount of half-and-half you'll need depends on the type and amount of soup as well as your preferences, so it's always best to add it slowly. Add half-and-half at the end of the cooking process, when you're sure your soup has gotten as thick as it's going to get on its own. While the soup sits over medium heat, stir in a few tablespoons of half-and-half. Continue adding the liquid, a few tablespoons at a time, until you're satisfied with the thickness. If you're short on half-and-half, you can work some kitchen magic by creating a substitute. Depending on your preferences and what you have on hand, you can combine either butter or cream with milk to simulate half-and-half. If you prefer to use cream, combine ¼ cup of cream and ¾ cup of milk to make a cup of half-and-half. To use butter, melt 2 tablespoons in a 1-cup measuring glass and add enough milk to fill it up. For those times when half-and-half isn't the right addition to your soup, you have a variety of other options when it comes to thickeners. A combination of melted butter mixed with flour is a classic thickener; cook the mixture in a sauté pan until it's light brown so the flour won't taste raw. When you're working with a chunky soup such as baked potato or pea soup, try scooping out a cup of the hot soup. Blend it with an electric blender and mix it back into the pot. Evaporated milk, plain yogurt and low-fat sour cream also can be used in the same types of dishes as half-and-half.